Andy Walton, Durham, UK "Left the mob after 11 years in '98. Moved down to London to work at Heathrow (with 4 other ex-movers!). Moved back up to the North East 7 years ago and have worked for a chemical company ever since." Andy Holiday, near Penzance, UK "Good to hear folks still want to keep in touch. Anyone finds themselves near Land's End give me a call". Allan Walker, Burnley, UK "Will get down to writing a couple of articles sometime." "Why haven't we heard from all the other MAMS teams? There was lots of sweat dished out. I know I was there. I could write a book, but who would read it? Only the distant cousins in NEAF/MEAF/FEAF MAMS Teams. Hello am I alone?" "Still serving, just into my eleventh year." "What a well done site. Just returned from a nine month tour in Afghanistan where I worked alongside a number of current and former UK MAMS folks at the Kandahar Combined Air Operations Terminal (CATO). " This is Sgt Nathan Harkess aka "Haggis" serving in Afghanistan, currently in Supply RNZAF Woodbourne after a stint as one of the RNZAF Air Movements Instructors. He's known as one of the shortest Movers in the Commonwealth. You're both correct - too easy huh? Life is too short - go ahead, use the good china! a. A special welcome to Melinda Cotton from the chap who opened the first Air Movements Section in Butterworth in, I think, 1948. We were so sophisticated in those days that the Air Traffic Control Officer used to drive down in his Jeep, and fire a Verey cartridge up the backsides of the water buffalo on the runway so that the Kuala Lumpur /Butterworth Courier could make a (fairly) safe landing . b. The ' biggest secret ' suggests that it is high time the other 97% of our readers got their A's into G especially when we recall how long your personal pocket has been taking the strain. 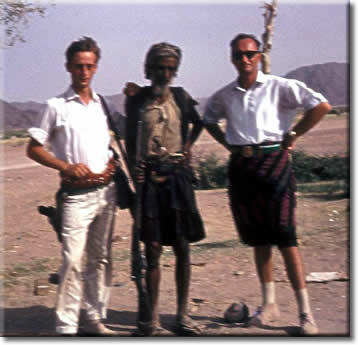 c. Recent mentions of Aden reminded me that we lived in a sweatbox flatlet on the Ma'aala Straight. In the neighbouring block lived all the medicos, nurses and the like. We called it Bedside Manor. d. Your readers may not know that you are about to go into dock to get mended. We all wish you well. Thanks for yet another great OBA brief. It must be Tim Newstead at the top but don't know the other faces. Also looks like it could be one of the bases in Singapore; Changi or Tengah. George Lynes has been in touch and he came up with the answer to my Mystery Photo but I see he did not apply for the prize this time. To Steve Broadhurst re the preserved pension, my pleasure friend, mine has been increased from April, no letter to explain just more dosh in the bank, great. Must send a reply to you Steve. On a more serious note Tony I am sorry to hear that only 3% have donated to the website, that is a shame and I hope many more will do the right thing, it really is very easy. Come on everyone, we don't want to lose this great asset. I suspect that the Sgt leaning against the offside mudguard is a younger version of my erstwhile FS Tony Lamb of my India Team 1973. The picture must have been taken in the 1960's judging by the stockings! 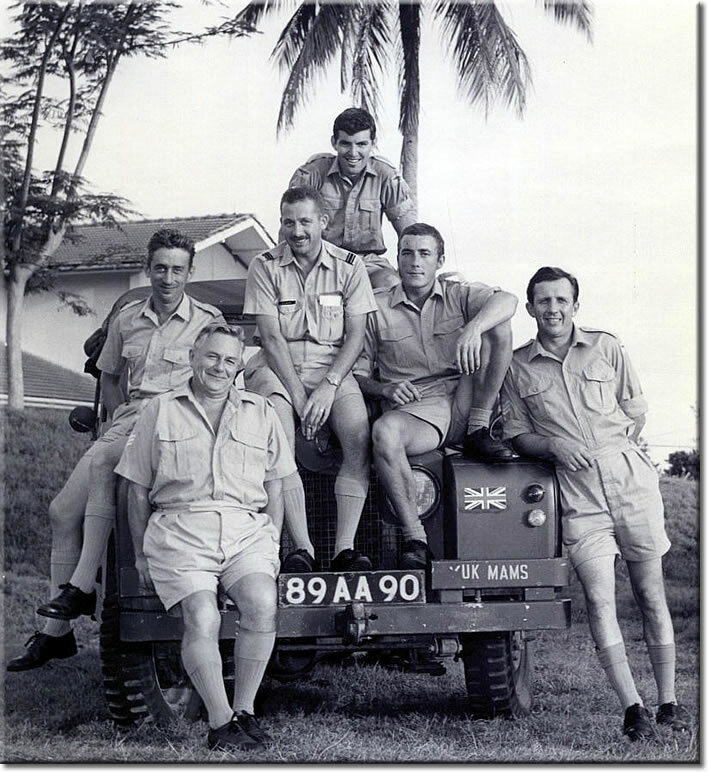 Don't know all the guys in the photo but I do recognise my great late pal Jimmy Jones, the one sitting on the right wing of the Landrover. 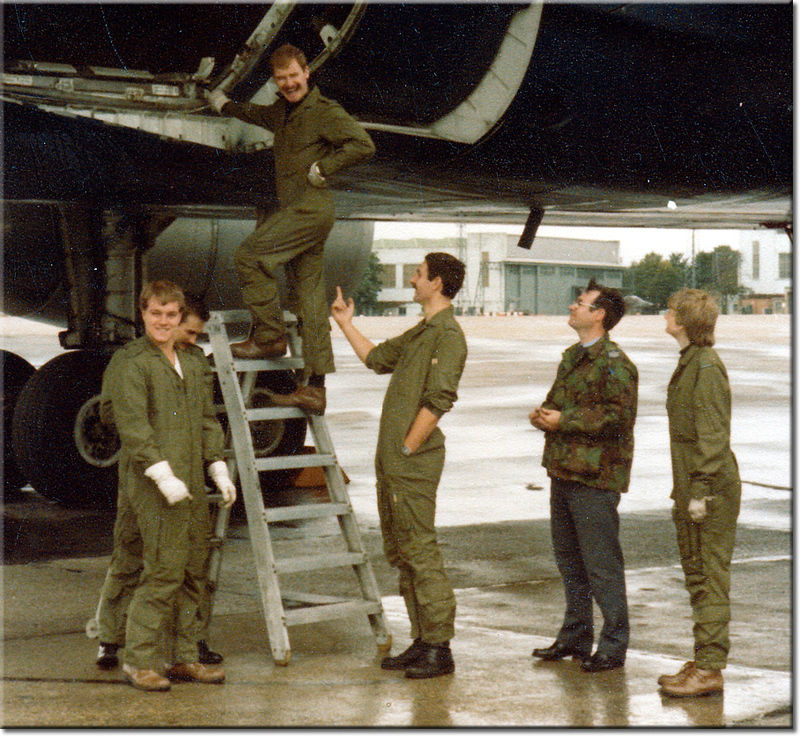 What times we had in Gutersloh and Brize Norton. Glad to see you are on the mend - Still not got round to hunting out more pics for you yet! My, didn't they scrub up well? Tim Newstead had provided the picture and wrote, "H Team at Changi on Exercise Bersatu Padu (you'll remember it well!) in June 1970 - LtoR: Cpl Jimmy Jones, Sgt John "Shep" Shepherd, Flt Lt Allan Walker, SAC's Tim Newstead & Bob Davies, and FS Taff Thomas." Just a note on the MAMS girl holding up the bumper board. The bumper board is used to protect the end of the ramp from damage when loading/unloading pallets. The bumper board before was made of wooden plywood and was hooked onto the end of the ramp. It was very heavy and cumbersome, to say the least! Thanks Steve - The accompanying text for the picture reads: 15 April 2007 - Kandahar Air Field, Afghanistan - Corporal’s Terry Parsons (background) and Lisa-Marie Guernon insure that the palettes on a CC-130 Hercules aircraft at Kandahar Air Field, Afghanistan are in place. Both are traffic Technician’s from 2 Air Movement Squadron based at Canadian Forces Base Trenton, Ontario and are on a six month tour to Afghanistan in support of Operation ATHENA. 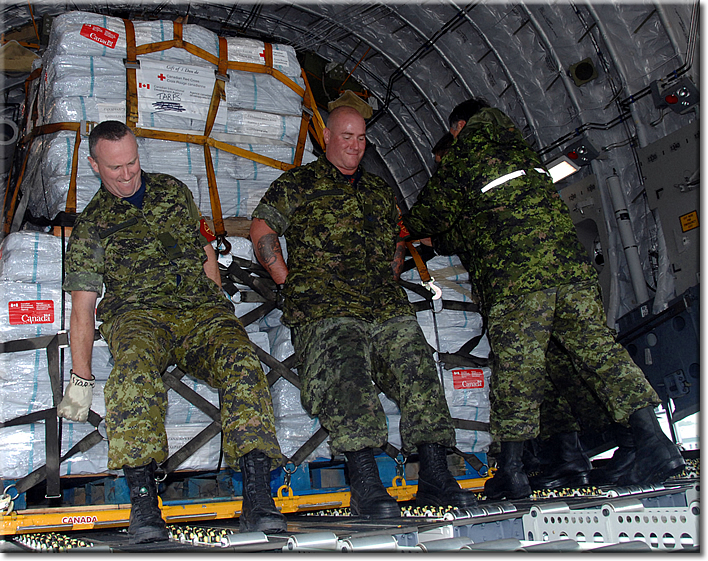 About 2500 members of the Canadian Forces are currently serving as part of Joint Task Force Afghanistan (JTF AFG). 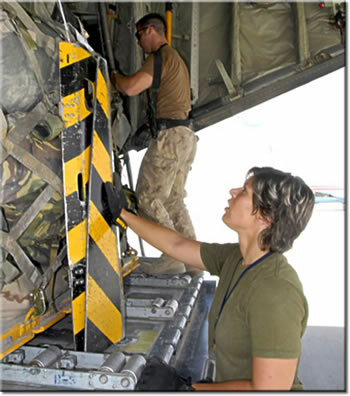 They play a key role in the NATO-led International Security Assistance Force (ISAF) mission whose goal is to improve the security situation in Afghanistan and assist in rebuilding the country. Did the RAF have an Airman's Wet Canteen? I thought they may have as we copied so much from you folks when we were building the RCAF in the post-war boom. If you did this is even more apropos. which lacks old charm and grace. was the Airman’s Wet Canteen. the Wet one and the Dry. you’d better just want beer. in the Airman’s Wet Canteen. and the old sweat LAC. was the presence of the Vets. was teach us to behave. no matter what the odds. on my eyes than on my fists. at the Airman’s Wet Canteen. Thanks Tony - the British Forces have the NAAFI (Navy, Army & Air Force Institute) that provides various services to the troops. I recall that there were several different poems or songs floating around about the NAAFI. Maybe some of our members have the words written down? A blue whale's aorta (the main blood vessel) is large enough for a human to crawl through. Just a quick update on where I’m at and what I’m doing. I’m no longer at Thumrait, Oman; I left in July 2007 after 4 years. I’m now back home in Springfield Oregon, working for the Springfield School District since October 2008 after being laid off from Hynix Semi Conductor, August 08. I will be back in the UK 16 July - 28 July 09, to visit my kids and see my first grandchild, Isobel, born 19 Dec 08, yes I know what your all going to say, I’m too young to be a grandfather.. I will be staying around the Calne area for most of that time, looking forward to the Meet and Greet on the 17th July, hope to catch up with Movers I haven’t seen for a while, so if I do owe you money you better be there.. I have just been 'banged to rights' by Brian Kent. 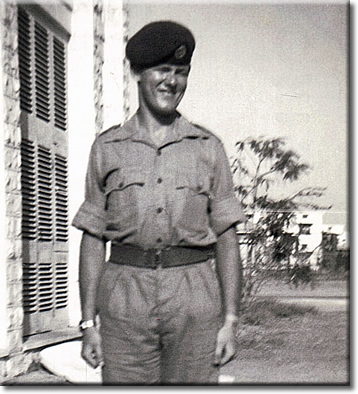 We were discussing who we remembered from our 'youth' and RAF Nicosia came to mind. I started to list the Movers that I recalled when Brian said "Well you remember Tony Gale don't you". So - Brian is about to email you with a story about a roundabout! I will now attempt to dig out some photos I took at the time of the Ace Freighters Connie we handled plus some of the Hastings flights we did - do you recall the Teheran Gas Cylinder flights we did for BOAC? Not to mention the El Adem fruit and veg Hastings. Your brain is 80% water. I have been meaning to ask you this question since I saw your name as the Webmaster. 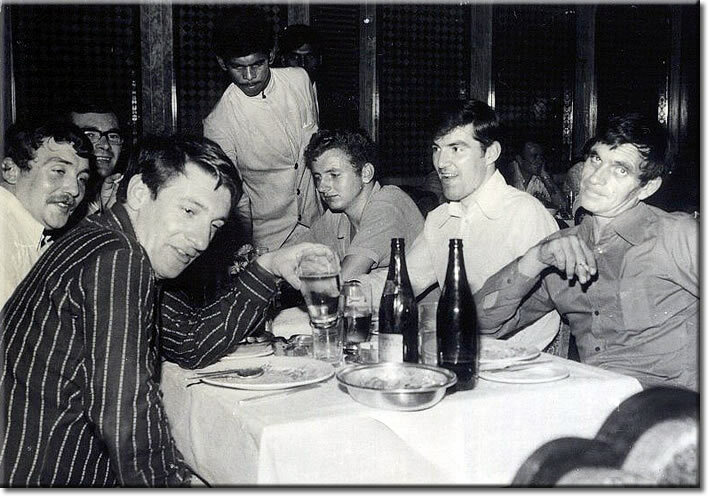 Were you a DAMO at Nicosia and possibly Akrotiri during the early/mid 60's? If so, do you recall the roundabout incident during the Cyprus evacuation? Do you have any info on Flt Lt Spaul, Chas Bootle (Mahjongg expert during quiet nights), a very young Bill Rollo (who I believe has now exalted to high rank) and Flt Lt McKenzie who I believe has now sadly left us. I would like to concur with all messages of condolance regarding Andy Wilson who, as everyone has expressed, a great guy to know and work with. A sad demise indeed. Would appreciate if any Lyneham members can recall Paddy Hagan or George Fyfe. During the Cyprus evacuation I was working at MoD Whitehall, in Mov Ops (RAF), and so was in the thick of it at the back end. Never did hear the story about the roundabout, but would be very interested in learning about it. 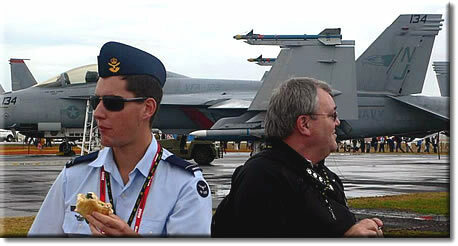 This shot was taken recently at the 2009 airshow held at Avalon in Victoria. How I would love to be the young chap on the left but, alas, I’m the old fart on the right. Flying Officer Sam Duncan is the son of a good friend of mine and someone I was pleased, in my small way, to help kick start his career in the RAAF. Sam is now the Logo Officer at 2 OCU based at Williamtown, just north of Newcastle in New South Wales. Yes, they do fly FA-18 Hornets and are currently getting excited about the arrival of the Super Hornet which will replace the F111’s. You’ll note it rained on the day, which was very much a blessing for us Victorian folk and didn’t, in any way, spoil the fun I had alongside Sam and his Dad, climbing over and through Fat Alberts, C-17’s etc, etc and an especially detailed overview of the Hornet by one of the OCU’s pilots. There 'aint nufink quite like chomping down on a 'amburger with the aroma of Avgas and Avtur in the air - gotta love them air show 'amburgers! You're looking good too Steve! Shadow defence minister Gerald Howarth MP calls for resources to be matched with spending commitments, arguing that existing manpower and equipment are being stretched beyond their current capabilities. A senior officer recently told me that the MoD has to find savings of over £500m between now and April. Those who admire and respect our armed forces cannot understand why the loyal and courageous men and women who have never failed the nation are being treated so disgracefully by a Prime Minister who has no problem conjuring up literally billions to hand over to bankers whose grossly irresponsible behaviour has contributed to the greatest financial crisis since the 1930s. The failure of the government in its duty of care to those who have been sent to protect the nation's interests in Afghanistan and Iraq is having a deeply damaging effect. Recently, the Chief of the General Staff (CGS), General Sir Richard Dannatt, warned again about the strain being imposed upon our armed forces. He said: "We have seriously stretched our soldiers to the very limit. Many families and marriages have unfortunately fallen victim to the relentless pace of operation." Little wonder, then, that the armed forces are nearly 6,000 short, with increasing dependence on commonwealth personnel to backfill. The most recent figures show that they account for over 7,000 of the current strength of our forces, as against 360 when Labour took office in 1997. 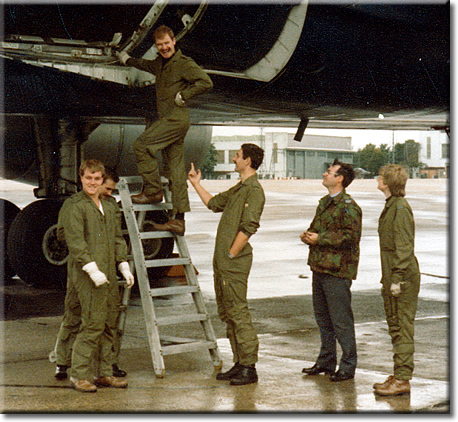 • The RAF is short of 88 Loadmasters (16%), a trade critical to operations in the field. 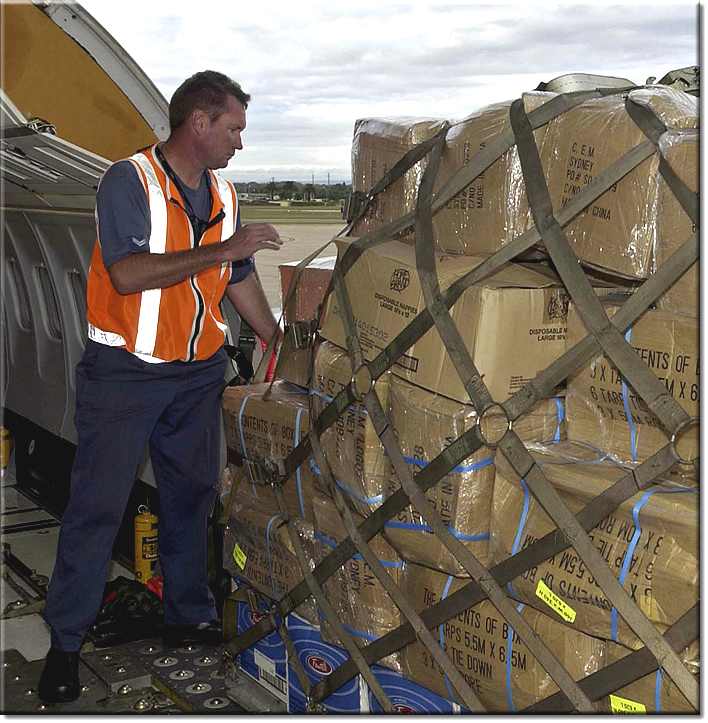 These shortages place yet greater burdens on those who remain in the services. I was made acutely aware of the problem when in Kandahar; I was told that the Royal Navy did not have enough technicians to service their helicopters, so mechanics had to take that particular strain. The harmony guidelines (which determine the interval between operational tours) are being breached in certain key areas. The average tour interval for the RLC was 15 months against a target of 24 months. 10.3% of army personnel are exceeding the guidelines that no-one should spend more than 415 days – that's nearly 14 months – away from home in any 30 month rolling period. The pressure gets to the families who are hugely supportive and deserve the heartfelt thanks of the nation for the tolerance they show. But who can blame the wife of the C-130 pilot who tells her husband – after repeated, dangerous tours in Afghanistan – that he either gets another job or it's divorce? CGS was unable to place a figure on the divorce trends in the services, but I think ministers would be well advised to compile those figures. What we do know is that for the year ending 1st September 2008, the voluntary outflow rate of RAF officers was 3% against a long-term sustainable rate of 2.5%. The figure for RAF other ranks is 5.8%, nearly 50% above the sustainable rate of 4%. If this trend continues, there will be serious consequences for the maintenance of capability. Overall, in the first six months of last year, there was a net outflow of some 1,250 people – overwhelmingly, 12,210 experienced people replaced by 10,960 rookies. With the Prime Minister falling over to ingratiate himself with the new US President, who can doubt that he will press the service chiefs to accede to any request from the United States for more British troops in Afghanistan? Then there is the issue of equipment. It is imperative to recognise that the equipment operated by the armed forces and their personal protection is a key component in terms of morale. Inadequate equipment, poor personal protection, and a shortage of spares has a profound effect on morale and hence on retention. 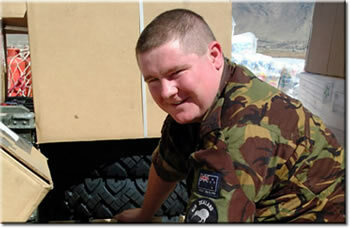 It is entirely true that the government has, in the last couple of years, sought to address this issue by the introduction of improved armoured vehicles, like the heavily armoured Mastiff, and more agile equipment like the Jackal, which those Members of Parliament who visited Afghanistan in November found to be extremely popular. However, the need to replace light tanks and reconnaissance vehicles that have been in service for nearly 50 years is becoming acute. The government has spent £132m on procuring a new utility variant of the battlefield taxi, the Future Rapid Effects System (FRES), but have now abandoned it. 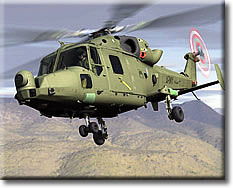 At the same time as announcing the scrapping of the FRES utility vehicle in December, the Secretary of State also told the House of Commons in a written answer (which could not therefore be debated) that the number of Future Lynx helicopters was to be cut by 10 at a time when everyone knows the acute shortage of helicopters in Afghanistan is inhibiting operations there. The scheduled delivery of the two new 65,000-ton aircraft carriers was postponed by 'a year or two', ostensibly to dovetail in with the arrival of the Joint Strike Fighter. The problem with that excuse was that the US lead company, Lockheed Martin, said that they were not holding up delivery of the aircraft, which could be available sooner if the MoD wanted them sooner. In an endeavour to secure the carriers, successive First Sea Lords have had to sacrifice frigates and destroyers, so from a requirement of 32 set out in the 1998 Strategic Defence Review, the RN is now down to 23. As Admiral West (now Lord West of Spithead and a Government Minister) said as First Sea Lord, "you cannot have one ship in two places." Other programmes were cut or postponed. Meanwhile, the RAF has to stagger on with aged Tristar transport aircraft to provide the airbridge between RAF Brize Norton and theatre. In 2007-08, nearly 30% of flights to Afghanistan were delayed, with 11% being over six hours late. That feeds into anger and frustration on the part of soldiers whose valuable leave is clocked from the moment they leave theatre. The relentless tempo of operations – with no end in sight for the Afghan campaign – the skill fade resulting from a reduction in training, the battle to obtain the right equipment to do the job (a constant fight with the Treasury), and the pressure from family at home: it's not difficult to see why the CGS' warning needs to be heeded, and heeded fast. And it's not that the warning is new. As long ago as 2003, in his Defence White Paper, the then Secretary of State, Geoff Hoon, said: "Since SDR, our armed forces have conducted operations that have been more complex and greater in number than we had envisaged. We have effectively been conducting continual concurrent operations, deploying further afield, to more places, more frequently and with a greater variety of missions than set out in the SDR planning assumptions." He continued: "We expect to see a similar pattern of operations in the future." There is thus no excuse for what has happened since, and it is not enough to say that the equipment shortfall has been made good by recourse to UORs funded from the Treasury's contingency reserve because there is a clawback arrangement under which the MoD will have to repay the Treasury around £200m in 2010/11 and potentially up to £365m in 2011/12. Furthermore, there is no plan for the incorporation of those UORs into the core programme. Critical defence research has also been cut. If we are to maintain our technology lead in key areas and have an intelligent customer base, that research must continue. Furthermore, failure to have something to offer the US will rapidly turn us from partner into supplicant, with disastrous consequences for our sovereign capabilities. The next Conservative Government will immediately initiate a new Defence Review. First, we shall establish what role we believe Britain should play in the world, what national interests need to be protected. Secondly, we shall determine what military capabilities we require to deliver that mission, and thirdly, we shall cost it. If we find in the then prevailing economic climate that it is unaffordable, we must then be prepared to change the mission, not squeeze the equipment and manpower to deliver a 'mission impossible'. At that point, the nation will have to decide what it wants to do in an increasingly unstable world. As we calculate the correct balance of forces, we need to repudiate the concept of 'It's THE war, not A war'. Of course we have to win in Afghanistan, but that unstable world requires a longer-term view. That is why we are committed to renewing Britain's independent nuclear deterrent, and to building the aircraft carriers that will provide a powerful and flexible response. In a significant move, the Leader of the Opposition, David Cameron, has now placed defence alongside health and education as key spending priorities as an acknowledgement of its importance. The Help For Heroes campaign, the turnout at homecoming parades and the hugely renewed public observance of Remembrance Day all point to a new pride by the British people in the extraordinary exploits of the soldiers, sailors and airmen of Her Majesty's armed forces. Whatever happens over the next 12 months, those entrusted with government have an absolute and unequivocal duty to protect those in their charge. For too long have we patched over the cracks created by the rotten foundation that the 1998 SDR has become, and our armed forces are paying the price in blood on the front line every day. For their sake, and the sake of the nation in the future, things must change. 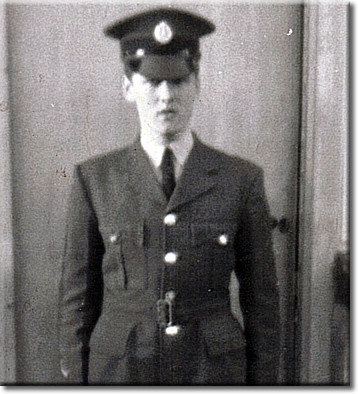 See attached photos, can anyone guess who the very smart young SAC (destined to be F/Sgt) is? The photo from Khormaksor is circa 1966. I can't believe how keen I was, what happened? We have no idea who that might have been Derek! More Monopoly money is printed in a year, than real money printed throughout the world. I have an old Mover buddy from the UK dropping in this Sunday; Stuart Cloke. Ian Berry should remember him from the 165 Officer's Movements Course back in 1983 when we used to make John Kenny & Dave Wall's (God rest his soul) life a misery. I also still remember (Bruce) Oram making my life a misery on the practical exercises, whenever I got things reasonably right, he’d play the belligerent aircrew type (were there that many?!) who wanted to change the load plan or take on more fuel, the bast*rd, great times though! The others in the photo (L-R) are Mark Brierley, Adrian ?, Stu Cloke, Andy (I really am Colour Blind – another story) Ralls, Ian Berry and Marilyn White (nee Whitmel). I will drop a photo stick in the post today, keep up the good work mate. I know you might not get too much feedback but there are a lot of us out here that really appreciate what you do to keep us together. Welcome back on deck and get well soon, keep taking the pills! Thanks for the well wishes Steve and I look forward to receiving the photos. TWO dangerous and exceptionally grumpy Australians have been welcomed to New Zealand after testing the patience of their in-flight cabin crew. 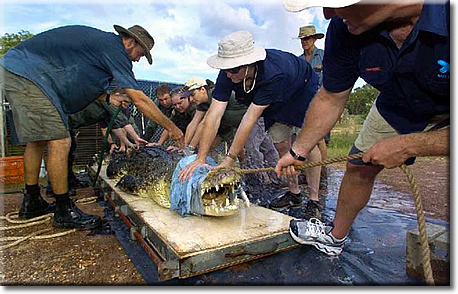 Saltwater crocodiles Scar, from Darwin, and Goldie, from Cairns, are the first of their species to be flown across the Tasman - and the pair weren't going to take the relocation lying down. The duo broke their head restraints mid-flight, thrashing so hard that the Hercules plane transporting them shuddered and shook. "The plane was shaking and the pilot turned to me and said 'that's your crocs having a bit of a go'. "We gave them drugs, a muscle relaxant to calm them down, and that seemed to work but boy, are they powerful. 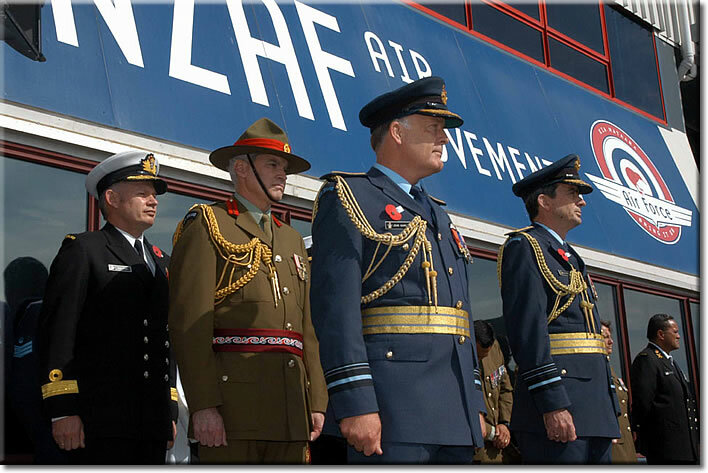 You can see why we needed the Royal New Zealand Air Force on this job." The Hercules was the only aircraft deemed large and sturdy enough to transport the monster predators. Both male, they are four metres long and weigh over half a tonne each, and are now the largest, and most dangerous carnivorous predators in New Zealand. The pair might have been groggy and "a bit grumpy" on arrival in Auckland midnight on Tuesday but they have since settled into the zoo where they are soon to become the star attractions. They form the centrepiece of a new saltwater crocodile exhibit, sponsored by Tourism NT, that will also feature several baby American alligators. Mr Dowsett said they will live in a 32 degree billabong - "a heated Sheraton" - but they won't be cosying up together. Their New Zealand keepers have been told to keep the pair apart in separate exhibits so they don't kill each other. "They're extremely aggressive so you don't want them anywhere near each other," he said. I was just looking at your list of unfinished articles on operations over the last 40 years and thought what a daunting task to have them written! However, I have been thinking of who we know who was involved in relevant ops and could possibly write the story or fill in the gaps? It's easy to name names but after writing articles for Team brief for nearly 20 years I know how nigh-on impossible it is to get a Mover to put pen to paper!! Sahel Cascade - Ian Place, Gordon Townsend? There are a few more listed which went on for years and involved many, many personnel - up to them to write hopefully? Thanks Ian - it was my hope that having seen the unwritten article titles - (home page http://www.ukmamsoba.com ) - it would jog people's memories into penning something about that experience that we could work with and turn into an article. As we know all too well, our work during and following the cold war went mostly unsung. Well here is an opportunity to set things right and remind the world that it wasn't only those up at the pointy end that deserved recognition! I trust that all is well with you and yours as is with me. Still working for a living with Royal Mail; had the chance to retire in 2007 at 60 but decided to stay on until 2012 to pay for the holidays that Angie & I promised ourselves many moons ago, and we are slowly working down the list of places to say been there - got the tee shirt. Had a great time out in your neck of the woods; did the titan tour from Calgary to Vancouver by coach/bus and we're planning to go New England/Niagara Falls and back up to Boston but have put that on back burner until the Pound -vs- US dollar improves. Nice to hear from you again Foddy - promise me you won't get lost again! Still above ground Tony; my good lady is a primary school teacher at a school just 15 mins away; eldest daughter who is coming up to 26 yrs has decided to join up – she is heading to the Intel trade with the Kiwi army – next daughter is an RN working at the local A&E dept (having just completed three yrs in Psyc! ); youngest daughter has just completed her Commerce degree in Acctg and Commercial Law/BA in German Language and Classics is to be completed this term and she is completing her professional diploma in acctg also – job hunting is next. Our son, is a trainee manager for McDs and a Rural Fireman. So all actively engaged. I kept out of uniform until 2006 – now a Lieutenant (RTrg) – this is part time – looking for a new position (recession issues). That said, we have five acres to play with so keep our horses, chooks and sheep! Hope you are keeping well and you are not suffering too much with the economic issues and of course the more recent flu! Take care my friend…..you can add Kiwi to the list of nationalities since we now have both passports. Well, I've received an e-mail from Alan D'arcy (who now lives in Torquay, UK) that he has heard that Mohammed (the grandson of those we met so long ago) has contacted him to say that he found your website, and by that me, and that he will be coming to the UK on Summer vacation from Pearson College in Canada. During that time Alan is going to bring him to see me and of course all those pictures of his ancestors. I'll keep you informed when it happens.